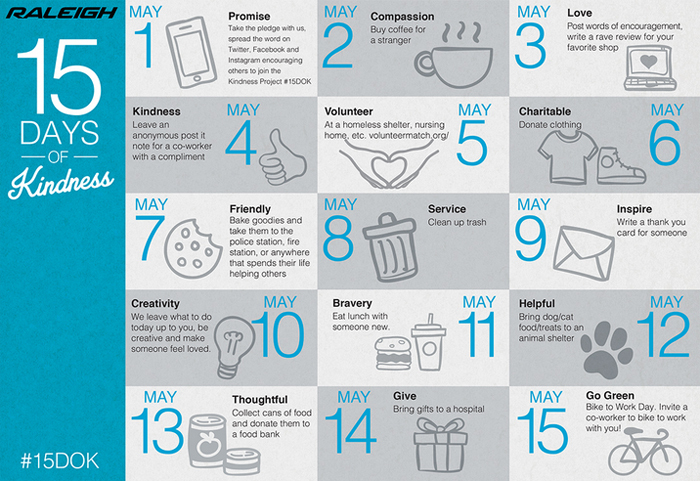 Raleigh Bicycles is proud to launch 15 Days of Kindness, an inspiring new way to celebrate National Bike Month. The challenge, focusing on traits such as kindness, bravery, and thoughtfulness, and ending on May 15 with “Go Green”, celebrates cycling and creates happiness in the every day. Each day, Raleigh asks that participants engage in simple acts that will influence and enhance the lives of others. To see each quality by day, view the Raleigh 15 Days of Kindness calendar. Your action for each day may vary, but the ultimate goal of kindness remains the same.